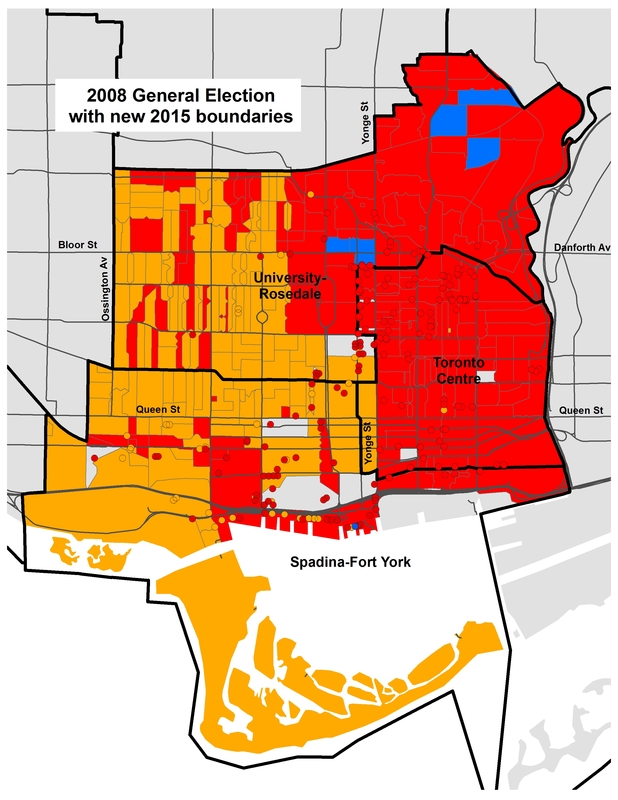 Back in April 2015, I looked at the impact of changes to the new federal electoral districts in three key downtown races: Toronto Centre, University-Rosedale, and Spadina-Fort York. The three downtown ridings were created by splitting two larger electoral districts, Trinity-Spadina and a larger Toronto Centre. As a downtown resident and political junkie, I was very interested in how previous election results would look with the new electoral districts. Could Toronto Centre, long held by the Liberals, go orange with Rosedale and Yorkville lopped off? 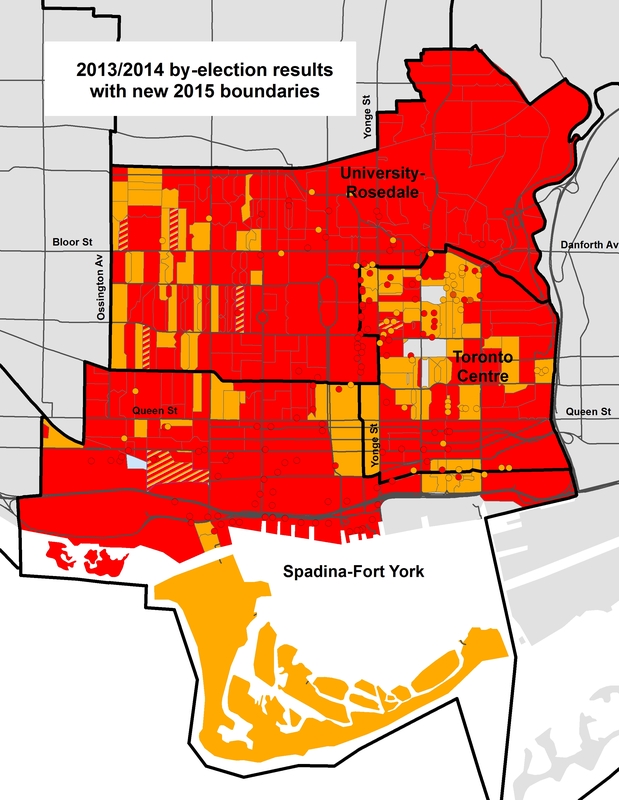 Would University-Rosedale and Spadina-Fort York become Liberal bastions with the new boundaries? When I wrote the original post, the Liberal Party had nominated candidates in all three ridings — Chrystia Freeland in University-Rosedale, Adam Vaughan in Spadina-Fort York, and first-time candidate Bill Morneau in Toronto Centre. I wrote more about all six candidates (and some of my personal opinions) in the original post. Back in April, the New Democrats nominated Jennifer Hollett in University-Rosedale and Linda McQuaig in Toronto Centre, but had yet to choose a candidate in Spadina-Fort York to run against Adam Vaughan. Vaughan, who took Trinity-Spadina in a 2014 by-election, was a popular Toronto city councillor. There were rumours that prominent criminal defense James Lockyer and former MP and mayoral candidate Olivia Chow were both considering running, but in late July, Chow formally sought, and won, the nomination. After the 2014 municipal election, in which Chow came in third place in the race for mayor, she accepted a position at Ryerson University. I expected that she was going to sit this election out, but I was proven wrong. All three ridings are proving to be interesting races. The Conservative Party of Canada (CPC) and Green Party have also nominated candidates in all three electoral districts, but only the Liberals and NDP are competitive. 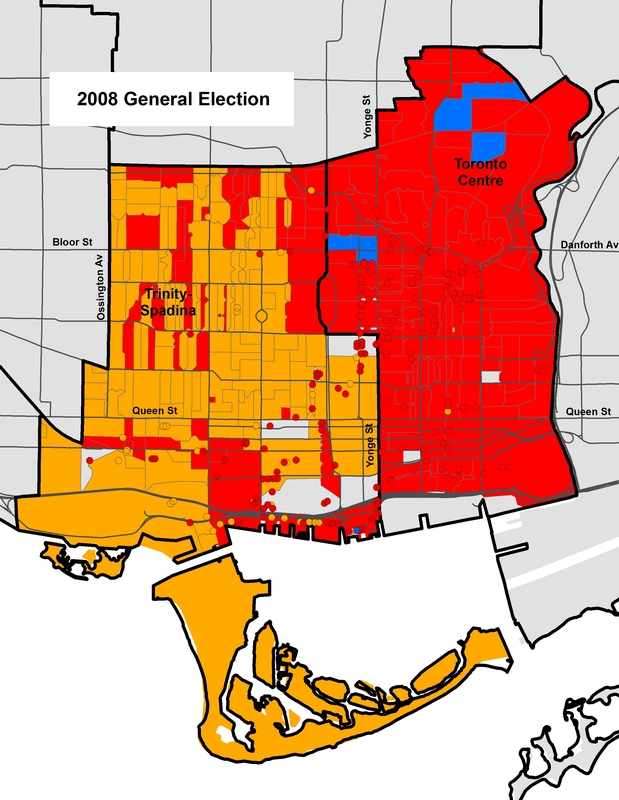 In this post, I added results and maps from the 2008 election, when the Harper Conservatives won a minority government, the Liberals were led by Stéphane Dion and the New Democratic Party, led by Jack Layton, came in fourth place in the seat count (after the Bloc Québécois) with 30 seats. Perhaps the 2011 election, in which the Bloc was nearly eliminated, the NDP became the Official Opposition and the Liberals relegated to third place, was an anomaly. 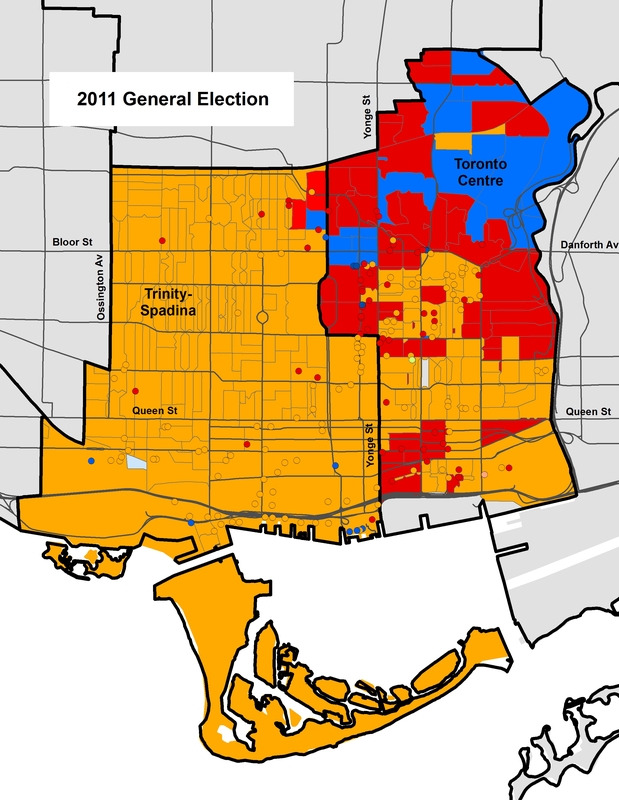 In Toronto Centre, the NDP kept gaining support since the 2008 election, yet the Liberals held on with comfortable margins in 2011 and 2013. In the 2013 by-election, triggered by Bob Rae’s retirement from electoral politics, the CPC vote share collapsed (as did voter turnout), and Linda McQuaig, the new NDP standard-bearer, more than tripled the NDP’s share of the vote in 2008. The NDP’s Olivia Chow, elected MP in 2006, was re-elected in 2008 and 2011. But her resignation in 2014 to run for Mayor of Toronto triggered a by-election in which Toronto city councillor Adam Vaughan took the riding for the Liberals in a by-election held on June 30, in the middle of the Canada Day long weekend. Voter turnout was a miserable 31.9%. I created two new maps in this post, looking at the results of the 2008 federal election. The first map shows each poll in the 2008 general election with then-current riding boundaries. 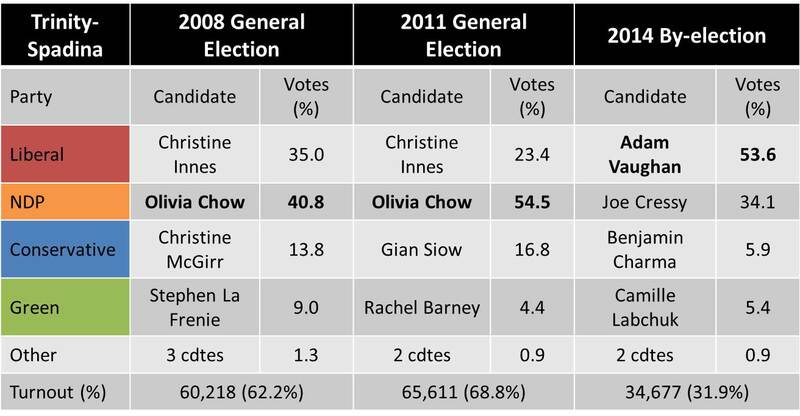 Olivia Chow was re-elected in Trinity-Spadina, taking 40.8% of the vote to the Liberals’ Christine Innes’ 35.0%. In Toronto Centre, Bob Rae was re-elected with a majority of votes cast, 53.5%; the Conservatives came in second, with 18.3% of the vote and the NDP in third, with 15.1%. 2008 general election, poll-by-poll results. Had the poll results been re-allocated to the new electoral districts, the NDP would win in Spadina-Fort York (though narrowly); the Liberals would have won by comfortable margins in University-Rosedale and in Toronto Centre. Note that votes cast in advance polls and special ballots were not counted in any re-allocated results. 2008 general election poll-by-poll results, with new riding boundaries. I previously discussed these maps in the original post I wrote in April. But here they are, in order to compare easily with the 2008 maps above. The NDP’s Chow took Trinity-Spadina, The Liberals’ Rae took Toronto Centre. But had the new riding boundaries been in effect; the NDP would have taken all three districts, but very narrowly in Toronto Centre. 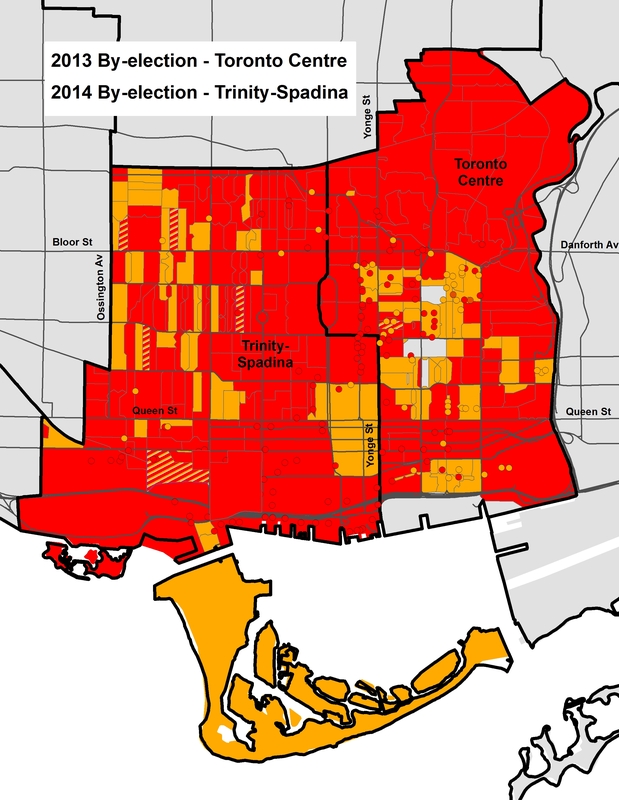 Since the 2011 election, as previously mentioned, both Toronto Centre and Trinity-Spadina saw hotly contested by-elections, in 2013 and 2014 respectively both were two-way races between the Liberals and the New Democrats. The Liberals took both, capturing Trinity-Spadina. Had the new riding boundaries been in effect in these by-elections, the Liberals would have taken all three; though Toronto Centre would have been a very tight race. It is difficult to make accurate predictions based on the results of previous elections, especially low-turnout by-elections. Nation-wide, the NDP’s level of support has recently been slipping, but there are still over two weeks left in this election; and in ridings where the Conservatives have little chance of winning more than 20% of the vote, they are all Liberal-NDP battles. Election prediction website ThreeHundredEight, as of October 2, predicts that Toronto Centre and University-Rosedale will go Liberal (though it is close in University-Rosedale), while Spadina-Fort York would return Olivia Chow to Parliament. The site does not rely on polls, so its model should be interpreted with caution. The Election Prediction Project lists Trinity-Fort York and Toronto Centre as “too close to call” but predicts that the NDP’s Jennifer Hollett will win. A MainStreet poll in mid-September had Olivia Chow in first place in Spadina-Fort York, with 45% to Vaughan/Liberals’ 39%. At the end of August, Forum Research had Bill Morneau and Linda McQuaig tied in Toronto Centre. A recent Forum poll had the NDP’s Hollett and Liberals’ Freeland tied in Univeristy-Rosedale. These are just polls, with small sample sizes. I’m reluctant to make any predictions, except that all three ridings will be close. Eglinton-Lawrence: Finance Minister Joe Oliver faces a strong contender in the Liberals’ Marco Mendicino, who won an ugly nomination against Eve Adams. The NDP candidate is former Saskatchewan finance minister Andrew Thomson. Etobicoke-Lakeshore: Unpopular Liberal leader Michael Ignatieff was defeated here in 2011 by Conservative Bernard Trottier, but the new Liberal candidate, James Maloney, may prevail in 2015. Maloney was appointed as a caretaker city councillor after Peter Milczyn resigned from council after being elected as a Liberal MPP in 2014. This entry was posted in Maps, Politics, Toronto and tagged 2015 Election, Canada, Liberals, NDP, Spadina-Fort York, Toronto Centre, University-Rosedale. Bookmark the permalink. Where are you getting these maps/data from? It’s hard to find at first, but Elections Canada has both electoral data and shapefiles of poll location LA and boundaries on its website, free to download.